What are some safety hazards that sewer workers face? On a daily basis, public works and municipal employees report to the streets to maintain our country’s critical infrastructure. 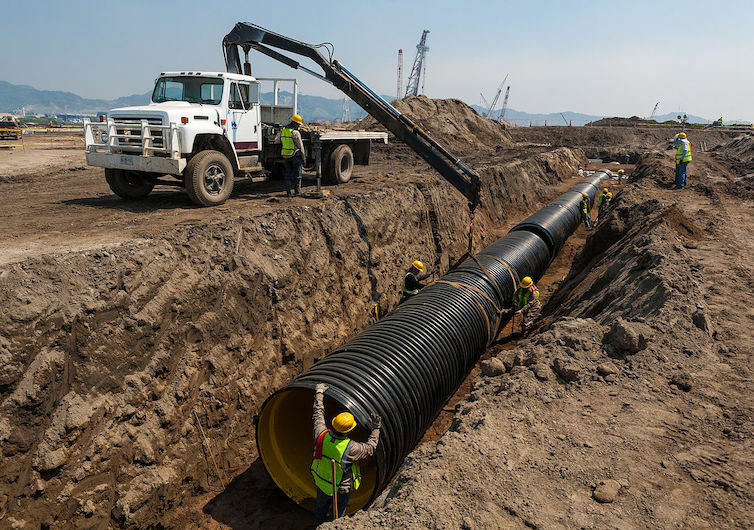 In the course of doing their jobs, they contend with a variety of traffic risks, biohazards, hazards within confined spaces, and the dangers of excavating and trenching. Safety protocols have been established to protect these employees. Want to keep safety and best practices in view at all times? Check out our FREE Safety Poster Pack. It has three safety posters that cover health and hygiene, traffic safety and confined space entry. What traffic safety procedures should wastewater employees follow? The Federal Highway Administration reports that in 2015, a work zone crash occurred once every 5.4 minutes. Taking extra precautions to make these zones compliant with traffic safety regulations is the best way to minimize risk. Determine the best traffic control methods based on federal, state and municipal guidelines. Submit a traffic control plan to the appropriate agency (local DOT, engineering, road department). Set up traffic control devices before parking vehicles or unloading equipment. Work with local businesses and residents to maintain access. Ensure that each worksite has essentials such as signage, flags, high-visibility clothing and barriers to ensure safety for workers. 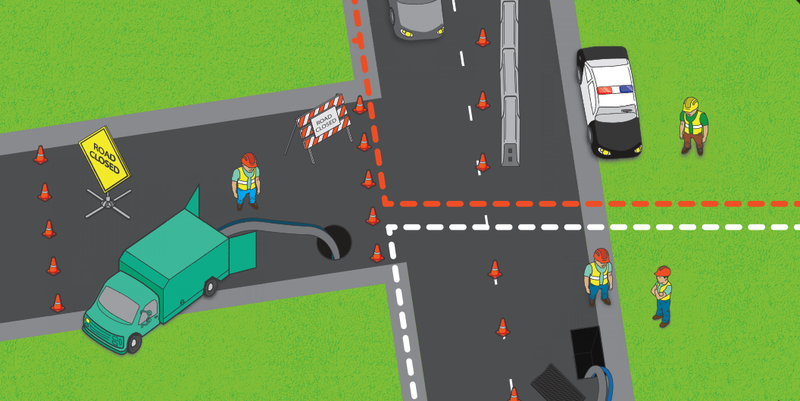 Set up Temporary Traffic Control (TTC) zones. What is a Temporary Traffic Control (TTC) Zone? During a temporary traffic control (TTC) zone, road traffic procedures are changed because of utility work activities. It is typically marked by signs, channelizing devices, barriers, pavement markings or work vehicles. One of the most effective ways to increase worksite safety is properly warning motorists of the upcoming work. Alerting drivers to changes in the normal flow of traffic will allow them to better prepare for entering and passing through the work zone safely. Signs, electronic reader boards or sign cars with lights are used to notify drivers of what to expect. Different speed zones require different signage to be effective. In high and moderate speed zones, multiple signs should be placed so they are not overlooked. These signs notify motorists about upcoming road work, speed reductions or lane merges that will affect them. After the advanced warning area, a transition area using cones and barriers can help smoothly merge traffic into fewer lanes leading up to the road work zone. 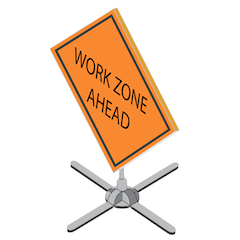 The actual work zone, also commonly referred to as the activity zone, has three separate areas to create a safe environment for workers and drivers. Work space. This area is set aside for workers, equipment and materials. Pedestrian barriers are always necessary. They should have railings extending a minimum of 8” beyond the edge. Buffer space. Optionally, a buffer space provides a measure of safety for workers and traffic flow. It is an empty space between traffic and work. Traffic space. The section of road where traffic passes the work space. After the work zone, “end road work” signs may be used to signal a return to normal traffic flow. To learn more about warning sign placement and TTC zones, request Envirosight’s Traffic Safety Poster. Ready to test your traffic safety chops? Take our Sewer IQ: Traffic Safety Quiz. What biohazards do sewer workers encounter? For the average person, regular hand-washing and use of hand sanitizer, as well as keeping up with vaccinations, is sufficient to stay healthy. For those who work in the medical field or around sewers, there is an increased risk of infection and disease due to biohazard exposure. Much like doctors and nurses take extra care to limit that exposure, wastewater workers should also take extra precautions. Waterborne diseases. These include viruses, bacteria and parasites. Common examples include amoebic dysentery and aseptic meningitis. Airborne aerosols. These include pathogens and chemicals, both of which are harmful to the body when inhaled. Sewer flies. While this is slightly less common, there have been documented cases of allergic asthma caused by exposure to sewer flies. Want to learn more sewer worker health and hygiene? Request Envirosight’s Health and Hygiene Poster. Ready to test your health and hygiene chops? Take our Sewer IQ: Health & Hygiene Quiz. What steps can you take as a wastewater worker to practice safe hygiene? Polio can be transmitted orally and can cause serious effects such as paralysis. Tetanus can be transmitted through cuts and can cause lockjaw and muscle spasms. 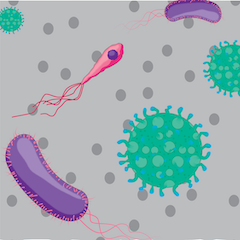 E.coli can be transmitted orally through food and water or a sick animal, resulting in fever, stomach cramps, diarrhea and vomiting. Hepatitis A is transmitted orally through contaminated food and water or an infected person, causing liver damage, jaundice, fever and vomiting. Typhoid fever is transmitted orally between people, or by food and water. It causes fever, weakness, rash and stomach pain. This list is not exhaustive. Other parasites found in sewers include salmonella, yersiniosis, encephalitis and many more. Most of these illnesses can be treated, but it involves hospitalization and antibiotics. Polio has no treatment. Getting vaccinated helps avoid a painful illness and it’s recommended that sewer workers discuss their options with a licensed medical practitioner. Gloves. Keep bacteria and viruses off skin, and protect from abrasions which are highly susceptible to infection. Boots. Protect feet and lower legs from contact with biohazards, and keep them at work to prevent the spread of dangerous bacteria to homes. Safety Glasses or Face Shield. Protect eyes from contact with biohazards via splashes and sprays. Respirator. Filter out airborne toxins, as well as splashes and sprays. Coveralls. Protect the body and clothing from contact with biohazards. While this equipment helps protect sewer workers from exposure to biohazards, it can only be effective when used properly and consistently. Wiping the cable and hoses with an antibacterial solution when retracting them. Cleaning the cameras, crawlers and nozzles with an antibacterial solution. Sanitizing door handles, controls, keyboards/mice and work surfaces. The last thing anyone wants is for the people they love to get sick. To prevent that, shower and disinfect yourself before returning home, and never take your work clothes or shoes home. Those items can easily be cleaned on-site or laundered professionally and keep work contaminants far away from the home. Want to learn more about health and hygiene best practices? Request Envirosight’s Health and Hygiene Poster. Ready to test your health and hygiene chops? Take our Sewer IQ: Health & Hygiene Quiz. What hazards might a sewer worker face when entering a confined space? According to data from the U.S. Bureau of Labor Statistics, an average of 50 workers die every year as a result of hazards in a permit-required confined space. Many of these casualties can be prevented by following established confined space entry protocols. Is large enough for a worker to enter and perform the assigned tasks. Has a limited means of entry or exit. Atmosphere. A hazardous atmosphere is depleted of oxygen or contains toxic gases like hydrogen sulfide, or flammable gases like methane. Engulfment. Engulfment occurs when a substance such as water or sand overwhelms workers, suffocating or crushing them. Trapping. Trapping occurs when the configuration in a confined space prevents workers from leaving the space safely. All of these hazards can be controlled and avoided through proper procedure and personal protection equipment. What preventative measures should a sewer worker take before entering a confined space? Sometimes entering a confined space is unavoidable. During those times there are a few things you can do to ensure your safety. By definition, a permit-required confined space presents more hazards and potential risks for sewer workers. Before even considering working in one of these confined spaces, it’s necessary to first undergo permit-required confined space (PRCS) certification training. If a worker is already certified to enter the confined space then it is still necessary for the supervisor to obtain the required permit. It’s important to note that this permit isn’t just a formality, it contains all of the necessary information regarding the potential dangers and recommended safety protocols. Simply obtaining a permit is not enough, it is vital to the safety of the sewer worker that the permit is read and obeyed. Remember, never enter a confined space alone. It’s always necessary to station an attendant above ground to observe the operation. In the event of an emergency, an attendant can be the difference between life and death for a sewer worker in a confined space. Be sure that the attendant is equally informed about confined space hazards so they are aware of what specific hazards to monitor for, as well as what the evacuation procedure is. Ventilator fans and ducts. Ensures you have a steady air supply and minimizes exposure to potentially harmful gases. A winch and harness. Ensures that you enter and exit the confined space safely. In the event of an emergency, it enables the attendant to assist in removal. Two-way radio. Maintains contact between the attendant and the worker within the confined space, allowing them to alert each other about hazards. Backup respirator. Minimizes risk in a hazardous environment by preventing the inhalation of chemicals and toxic gases. Gas monitor. Monitors the air quality in a confined space. Remember, denser gases sink, so it is necessary to test at the bottom of the manhole. A personal gas monitor should be used when a worker enters the confined space to continuously monitor gas concentrations. Workers should never enter deteriorated structures or cavities with high flow or loose soil, as these have a higher risk of engulfment. 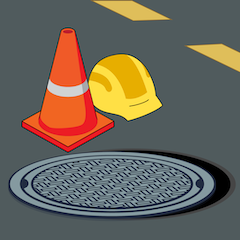 Confined spaces always present risks for sewer workers and the only way to truly avoid these risks is to avoid entering a confined space whenever possible. Before entering a confined space it’s first necessary to perform a complete assessment of all hazards. Be sure to review the proper evacuation procedure and check that the necessary equipment is present and ready for use. Also, it is vital that anyone that enters a confined space has been trained on proper protocol. In order to minimize personal endangerment, consider conducting your sewer inspection with video sewer inspection equipment. A manhole inspection camera, CCTV sewer inspection crawler, video nozzle and zoom camera provides sewer workers with everything they need to quickly and efficiently complete a sewer inspection without exposing themselves to potentially lethal atmosphere hazards and risks like engulfment and entrapment. Need a resource to keep you and your crew safe when working in confined spaces? Request Envirosight’s Confined Space Safety poster. Want to test your confined space safety chops? Take our Sewer IQ: Confined Space Safety Quiz. What safety precautions should sewer workers take when excavating and trenching? To be safe and compliant with OSHA standards, a “competent” person on your team must be identified. Per OSHA, this individual, “must be capable of identifying existing and predictable hazards, or working conditions that are hazardous, unsanitary or dangerous to employees, and who is authorized to take prompt corrective measures to eliminate or control these hazards and conditions.” Ultimately, the competent person will be responsible for managing the trench site and its workers’ safety and taking action if conditions are subpar. Inspections must take place daily, prior to work entry of an excavation site, after rainstorms, and as needed throughout shifts or after other hazardous events. The competent individual will need to look for indications of possible cave-ins, failure of protective systems, hazardous atmospheres and other hazardous conditions. Should anything appear wrong, they must be able to take action accordingly. Inspections should study the soil and protect it accordingly. Soil analysis is to be done by the competent person both visually and manually. Soil type and the appropriate cave-in protection will need to be identified as well. Sloping, trench boxes and shoring are all available methods, but their use should correspond with the right soil type. Learn more about safety procedures of excavating and trenching in the article: Dangers of Digging. Ready to Test Your Safety Chops?